According to the IRIN article below, Swaziland is experiencing its worst ever harvest, due mostly to drought, as well as erratic rainfall patterns and overgrazing. 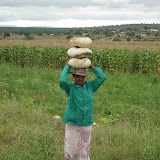 Swazi people in the rural area where Cabrini Ministries is located traditionally made their livelihood as subsistence farmers, and the primary crop was maize (corn). Corn, however, does not fare well in drought. In addition, the HIV/AIDS crisis affects the success of a family’s agricultural endeavors. The disease affects the adult generation that is in the prime of their working years. Children whose parents are sick or dead from AIDS often do not have the skills to successfully farm by themselves. We have five hectares (10 acres) of land that we are cultivating at St. Philip’s Mission. We use the harvest from our farm to supplement the diets of the children at our hostel, the people we serve with our healthcare outreach program, and other children and families on homesteads. Our farm is a powerful symbol of life and hope for the community, and the children also help out on and learn valuable agricultural skills from the staff. You can see the red dusty earth in the background… but our crops are green because our sprinklers are working great! We are proud to report that our irrigation system is working well and is the key to our farm being productive amidst the drought. As the heat ends and we go into the winter months, the crops are more abundant and the HIV patients we serve are receiving more fresh vegetables each week. Our butternut squash has been a real winner this year, and we think it is the best in Swaziland. We also receive food from the World Food Programme (cooking oil and a nutrient-enhanced corn-soya blend) and buy our food from the markets (thanks to our donors). We are seeing a great need for more food supplies in the area, especially for our HIV and TB patients. People taking HIV medications (ARVs) need to take those medications with food, or they will get sick. Unfortunately, one meal of mealie (ground corn) a day does not provide the sustenance they need to absorb and use well the medicines they are receiving. Our agriculture department is looking into what crops that grow well are particularly beneficial to people, and will help the most people. Many of the children, when they first came to live at the hostel, had been malnourished, and took a while to adjust to understanding that they would have regular food. They would often gorge instinctually, and we would have to tell them to slow down, and eat calmly and slowly and just enough. From not knowing when food would come again, the kids learned that when it did come to eat as much as fast as possible. Experiencing the pain of hunger so young, you don’t forget it easily. Blessings and thanks to all of our friends and supporters out there! Together we form a circle of love which brings the living water of love to this dry area. Welcome to our Blog. Though the word is still strange to us, many of our friends, including Nicholas Kristof of the New York Times who visited in June 2006, suggested that we start one. So, this will be a way that we (Sr. Barbara Staley and Sr. Diane Dalle Molle) and our colleagues in Swaziland can share with friends, family, and supporters. We’ll use this Blog to tell what days are like here, what’s going on with the children, programs and projects like the farm, and how the community is faring. We’ll also provide links to further reading about Swaziland and the issues we face here. We’ll also have links to the Cabrini Mission Foundation — newsletters, pictures, and other updates — and lots of photos of the children and life around St. Philip’s Mission. To get started, we’ve added posts to bring you all up to date on Cabrini Ministries and its work in Swaziland. Join us in living the work. And do be sure to add your comments, and share this blog with friends. We’ve got a lot of great photos to share with you. Click on the squares below to view some of our photo albums. 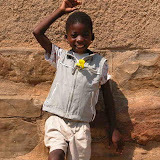 OVC Hostel – established to care for the high rate of children orphaned by AIDS. 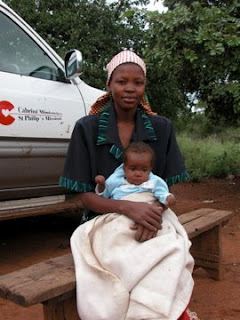 Many of the children are compromised by malnutrition and chronic conditions such as TB and kidney disease. Children receive full room and board, as well as health care, and educational, emotional, and psychosocial support and other services. Children visit their homesteads and remaining extended family members often in our effort to keep them connected to their communities. Great emphasis is focused on nurturing the childrens’ Swazi identity. 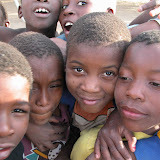 Click on Care of Orphans and Vulnerable Children to read more about the orphan care program. Home-Based Care – Started with a grant from the Bristol-Myers Squibb Foundation, the Home Based Care program focuses on caring for the sick and dying, testing for and monitoring HIV and TB, helping people begin treatment, and transporting people to the hospital to receive treatment. Click on Health Care Outreach to read more about the health care program. Education – The educational program began over fifteen years ago when it was discovered that many children in the homesteads were not in school and their families could not afford to send them. With the assistance of the Swiss Solon Foundation, once the children are on the foundation grant, their education is guaranteed through 7th grade if they pass. This increases their chances for individualized growth and better employment opportunities. A special tutoring program called the “Bridge School” program helps students study intensively to reach the grade level appropriate to their age. Agriculture – In 2005, Cabrini Ministries established an irrigated farm. This project provides supplemental fruits and vegetables for the patients in the health care program and the OVC children in the hostel, and helps to create a sustainable income for those children and adults learning agricultural skills and maintenance. Skills-training/Staff at Cabrini Ministries– Cabrini Ministries employs about 40 local Swazi people to help run all of the above works. Training is provided as well as income and other benefits for our employees. An aftercare program has also been established to help hostel children 18+ build the job and life skills and experience they need to take care of themselves as adults. One of the two main works we do at Cabrini Ministries Swaziland is Care of Orphans and Vulnerable Children, or OVC (the other major work is Health Care Outreach). The child care program was established in 2002 to respond to the HIV/AIDS and TB pandemics by caring for OVC and helping their extended families. One of the most apparent effects of the swift spread of HIV in the community was the growing number of children rendered parentless. Children were taken in by relatives, neighbors, or in some cases were forced to fend for themselves. In 2002, a boarding hostel was established on the Mission in response to the local orphan crisis. The Hostel was to provide food, shelter, and supervision for many of the children who had lost both of their parents (often termed double orphans) and were living by themselves at a child-headed homestead or some other equally dangerous living situation. Fifty children were originally admitted, with the number nearly doubling by the end of the first week. Many of those inaugural children still reside at the Hostel during the school year, with new intakes coming every January. We currently have about 120 orphans living at the hostel, many as groups of siblings as we try to keep families together. The child care services provided by Cabrini Ministries extend beyond a roof above the heads of 120 orphans; the Hostel has become a home where local women provide these vulnerable children with loving care, medical services, balanced nutrition, school enrollment as well as educational enrichment activities, and assistance in strengthening and maintaining positive relationships with what family they have. In several instances, Cabrini Ministries has helped children find family they did not know existed, and in that way have taken an active role in restoring life for these children. Many of these services have been made possible through child sponsorship facilitated by Cabrini Mission Foundation in the United States and Cabrini Health in Australia. Since 2002, individuals have also made annual contributions in support of children residing at the Hostel. We’re very excited to report that this year Mrs. Petronella Mamba Mnisi, originally from the Mamba kingdom, one of the three chiefdoms served, has become our first sponsor from Swaziland! It’s very rewarding to see such generosity come from within the community. We hope to see more Swazi sponsors to follow. As organizational and paradigmatic growth has occurred, we have moved from speaking only of the Hostel to a broader label of Child Care. Over time, it has become clear that here is a need for expanding services to new levels of care, with a goal of providing psychosocial support to the children of the community. These extended services include providing educational sponsorship to over 100 children from the area, transition programming for Hostel children moving on to the next stage of their lives, and increasing assistance with legal documentation and other referrals. Acquiring legal documents like birth and death certificates – which are not automatically distributed in Swaziland – is vital for orphaned children to receive many of the services for which they are eligible. Cabrini Ministries is seeking ways to expand support in facilitating these processes throughout the community. For example, the organization has begun exploring relationships with local caregivers of Neighborhood Care Points (NCPs – gathering points where orphans and vulnerable children receive a meal and supervision from volunteer caregivers from their area) to identify potential points of collaboration. This expansion of services will mean good things for the children of the three chiefdoms served by Cabrini Ministries as we continue to act on our long term commitment to improving the life of each child. Yet it will be a slow process, requiring development of understanding and skill among the staff and organization as a whole. Hopefully it will mean the restoration of more lives, and increased hope for the future. The Missionary Sisters have been serving at St. Philip’s Mission in the rural lowveld region of Swaziland, Southern Africa since 1971 at the request of King Sobhuza II and the Servite priests. Today, they continue to serve at the mission running the health care services and boarding hostels, as well as teaching in the school and providing skills training. * Education of the children in the homesteads. Cabrini Hostel – The Cabrini Hostel was established as a direct response to the high rate of children orphaned by AIDS, who have been left without parents or with only one parent. The Hostel is designed to help all of its children stay connected to and rooted in the lives of their families and homesteads. Great emphasis is focused on nurturing the childrens’ Swazi identity. Education – The educational program began over fifteen years ago when it was discovered that many children in the homesteads were not in school and the families could not afford to send them. Over the years, sponsors have helped support many of these children, but as the pandemic of AID/HIVS became increasingly pronounced, many more children needed support. With the assistance of the Solon Foundation, a Swiss foundation helping countries in Southern Africa with education, once the children are on the foundation grant, their education is guaranteed through 7th grade if they pass. Cabrini Ministries has been able to support 120 children and these children are now given a chance to grow as individuals, have better employment prospects in the future and become good citizens of Swaziland. Home Based Care – Started in 2000 with a grant from Bristol-Myers Squibb Foundation, the rural health initiative for HIV/AIDS education was established. The Home Based Care program focuses on caring for the sick and dying, testing for HIV; helping people begin treatment; transporting individuals to the hospital to receive treatment. At the present, Cabrini Home Based Care program serves over 200 people and is in operation 5-7 days a week. Agriculture – The lowveld region is very dry and in the past 10 years has been experiencing a drought. 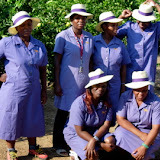 In an effort to bring food to the sick, the elderly, and the orphaned children in the hostel, as well as the homesteads, Cabrini Ministries in 2005 established an agriculture project. This project provides water for drinking and food and helps to create a sustainable income for approximately 200 people in addition to serving the children housed at the hostel. Click on the link to download a PDF of the Cabrini Ministries Swaziland 2006 Report, to read about the concrete progress achieved in the various fields of activity in 2006. 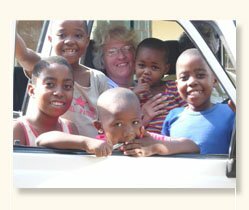 Sr. Barbara Staley, MSC, lives and works at the Ministries in Swaziland. Among her many duties, she manages the staff and oversees the functioning of the children’s hostel. 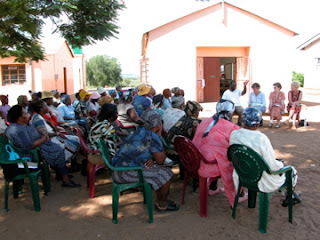 Sr. Barbara is the main voice of the Blog in Swaziland. Sr. Diane Dalle Molle, MSC, also lives and works at the Ministries in Swaziland. Among her many duties, she manages the healthcare outreach program and is the Director of Cabrini Ministries in Swaziland. Erika is the technical blogger behind the Cabrini Ministries Swaziland Blog. Srs. Barbara & Diane, Erika, and others have helped build and shape the Blog, and continue to work together to communicate stories from the field through the medium of the Blog. Erika is the main contact person for the Blog in the US. If you have any questions or feedback, please feel free to contact us. Thanks for visiting our Blog!